Page received a PhD in economics from the University of Michigan, and came to UC Davis in 1996. She currently serves as co-editor of the Journal of Policy Analysis and Management, and previously served on the editorial board of Education, Finance and Policy. She is a research associate at the National Bureau of Economic Research, a research fellow with the Institute for the Study of Labor, and a Visiting Scholar at the Federal Reserve Bank of San Francisco. She has also been a member of the Board of Overseers for the Panel Study of Income Dynamics. 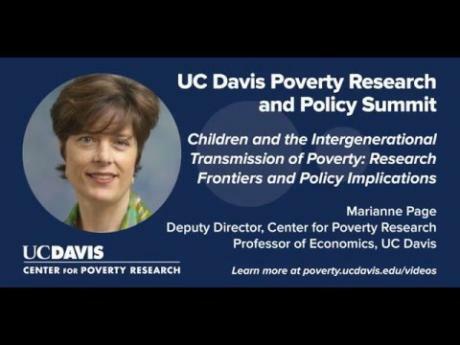 Center for Poverty Research (CPR) Director Marianne Page and Faculty Affiliate Marianne Bitler will present their research this month at the Institute for Research on Poverty’s (IRP) annual summer research workshop. Each June the workshop brings together poverty scholars at all stages in their careers to present their research on low-income populations. 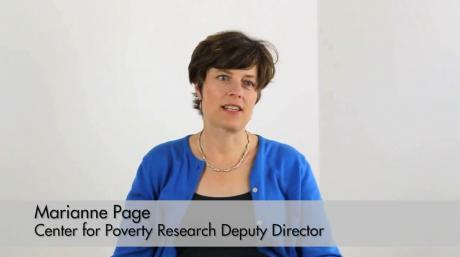 In this video, economist Marianne Page talks about how increasing academic achievement among children in poverty can help them to achieve their potential.